Momma Told Me: Be a little different. It's no secret we're a little 'off color' here at Momma Told Me- while we appreciate tradition, there are some things we prefer to break free and stand out from the crowd on. Unique seasonal door decor is one of them. Yes, we're talking wreaths. For year I have wanted to make my own Fall wreath, but lacked the patience, or budget, for the more elaborate 'professional' style D.I.Y. wreath. Don't get me wrong, Martha Stewart is great for most people- but when I sit down to create something I'm going to display in (or on) my home, I want it to be immediately obvious that is' home made. A lot of the gorgeous wreath tutorials out there cost just as much as the store bought one's to make, and look slick enough to be store bought when done. 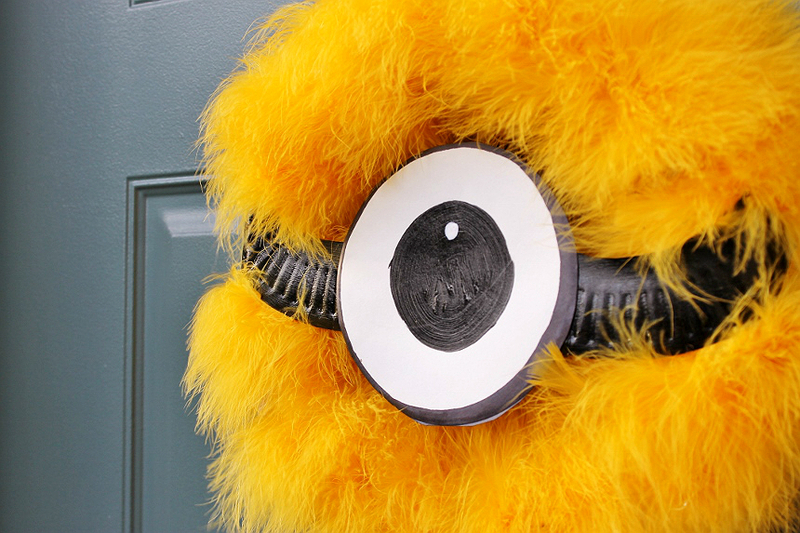 My friends, you will not find a Minion wreath in any store, and it is crazy easy to make. 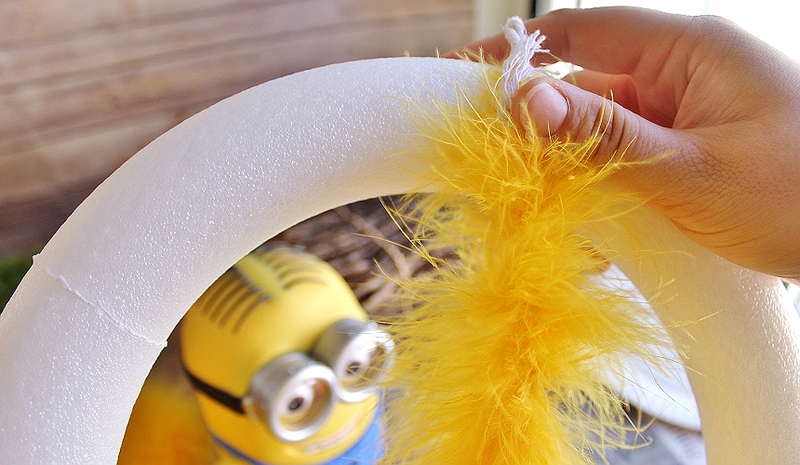 Start with a medium foam ring from your typical craft store. This will be the bulk of your materials cost, as these can run $6-$8- but I'll let you in on a little secret. If you head online to Micheals/JoAnns/Hobby Lobby you can often print a coupon to save 40-50% on a single item and knock that price to just a few dollars. The second most expensive supply, the boas, are about $3-$4 a piece- you'll need 2. Again, bring the hubby, or the kids and use multiple coupons in your trip (it's usually 1 per person.) 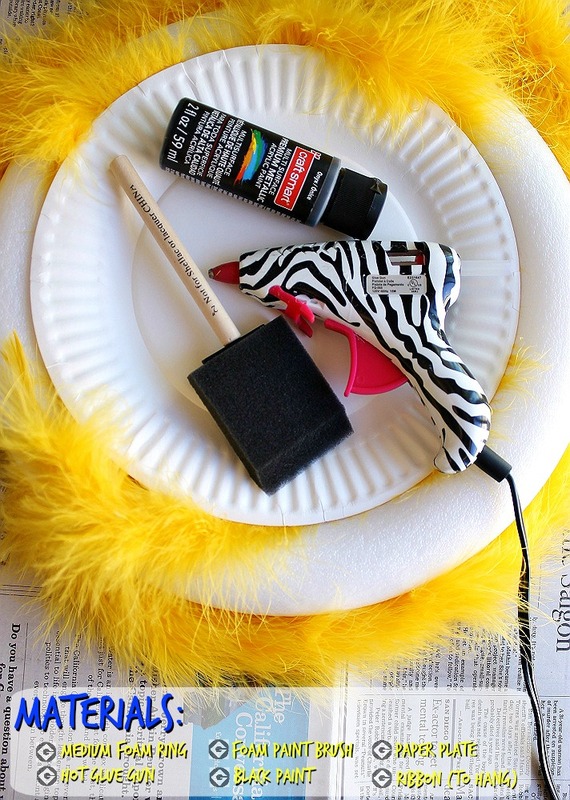 The rest of the supplies you likely have hanging around; a hot glue gun, some ribbon (for hanging,) black acrylic paint, a paper plate, a paint brush (I use disposable foam brushes) and some newspapers to cover your work space. Are you ready? It just might have taken you longer to gather your supplies and protect your work space than to assemble this wreath, because this bad boy goes together with no skill level and faster than I can say 'banana' 3 times. 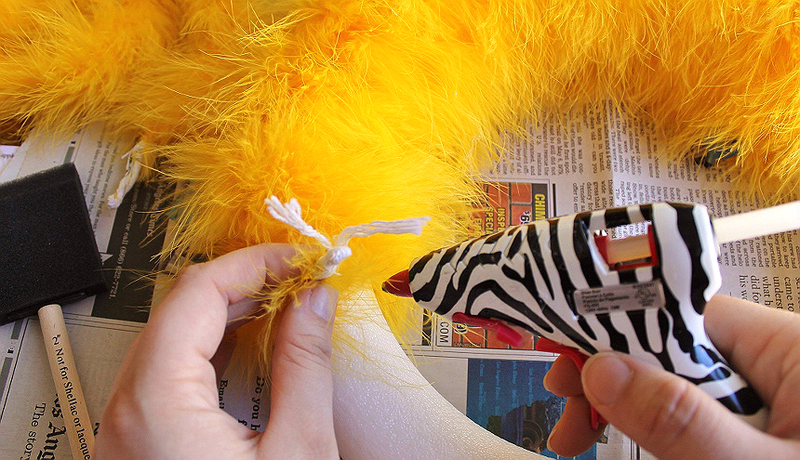 Start by taking the end of one boa and hot gluing it to the back of your wreath foam ring. 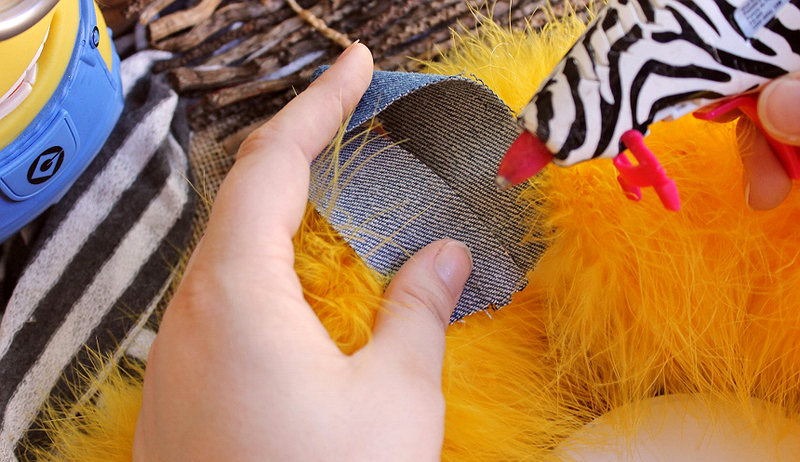 Next, loosely wrap the boa around the foam ring so that the feathers cover the ring, but there is enough give to move the boa to the side as needed for the later steps. Tack the loose end of the boa onto the foam ring and repeat with the 2nd boa, end to end. 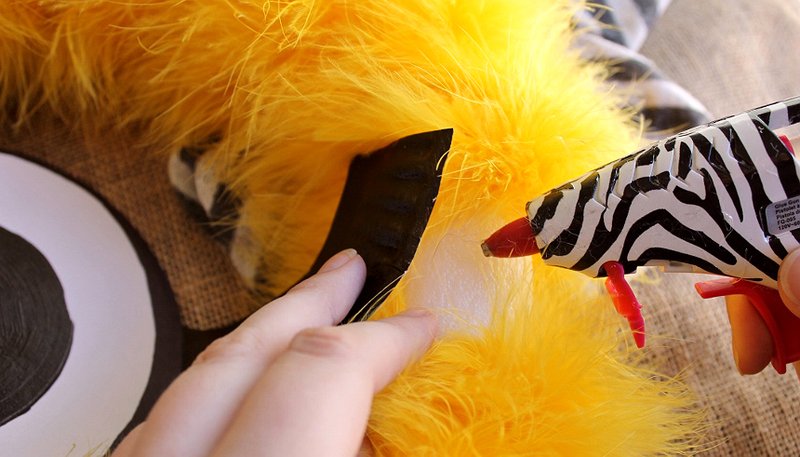 You should have what looks like the beginnings of a fabulous Carnivale hat, or at least a wreath that resembles an abstract Tweety Bird. Go ahead and shake it back and forth like a 3rd crader fascinated by the movement of the feathers (I won't judge,) it's impossible not to feel happy when playing with feathers! If you want to get a little fancy pants you can add some detailing to the eye. 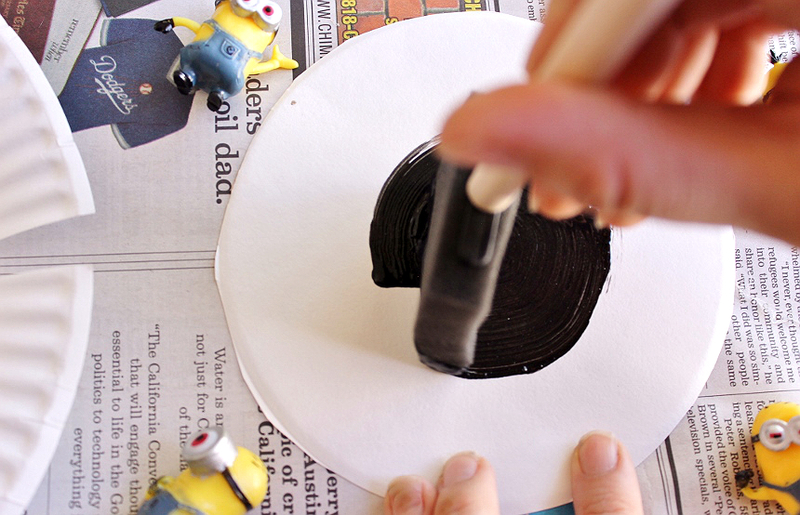 Using your black paint go ahead and draw a black rim along the outside of your round (flat) eye and make one of the border's edges a little thicker to indicate the traditional Minions goggle frame. 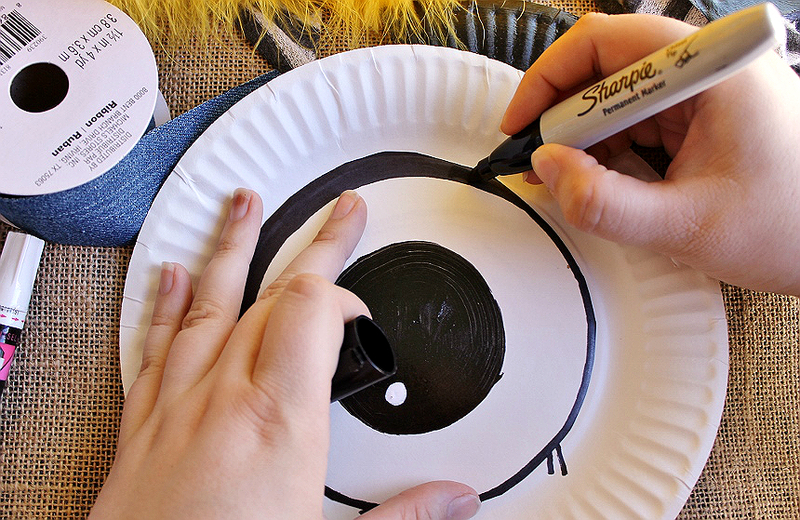 Take a daub of white paint/white paint pen/white out and draw a little circle of reflective light in the iris of your eye. 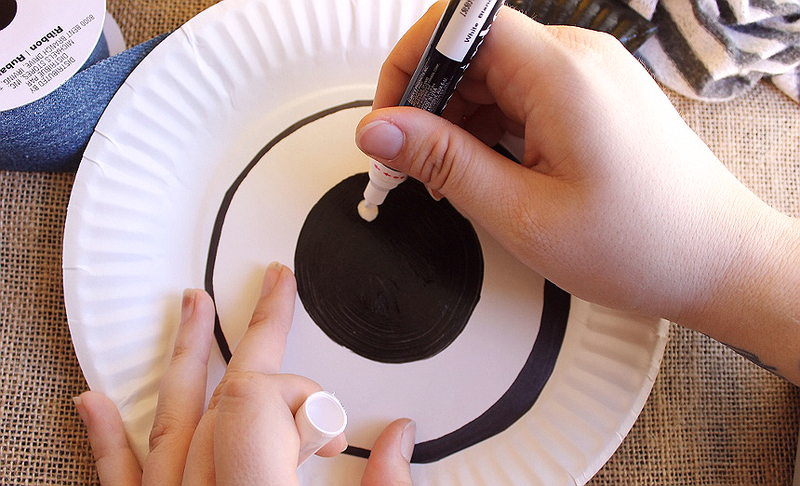 Glue your dried black painted plate strips to the inner eye circle evenly. Attach your goggles/eye to the wreath by gently separating the wrapped boa and gluing the paper plate portion directly to the foam ring. Repeat on the opposite end and even out the feather distribution to hide your handy work. Next, loop a few inches of ribbon and glue it to the top (back) portion of your wreath- paying attention to glue directly to the foam ring again, or the ribbon will not adhere. 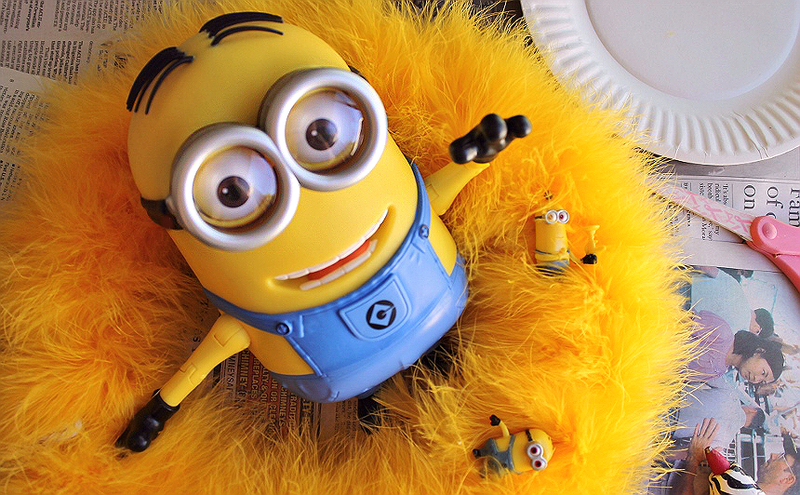 Congratulations- you've just made a Minion! 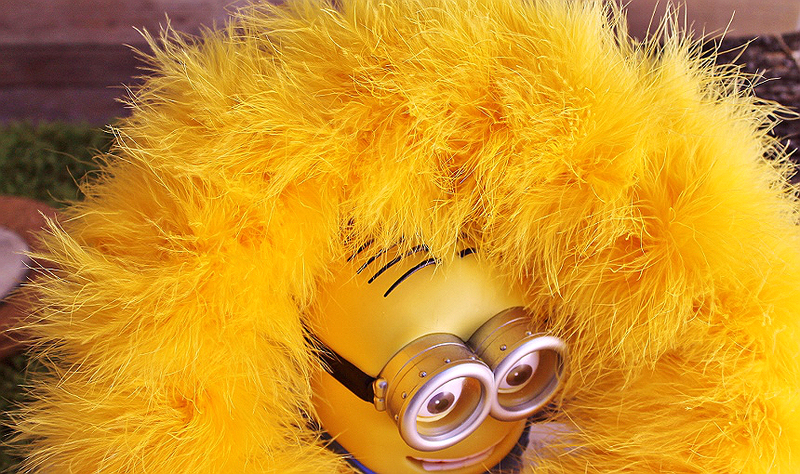 Wouldn't these be cute in purple as well for the 'monster' minions from the Despicable Me 2 movie? How about doing this with 2 small foam tubes and chaining them all together to make Bobe, Stuart, and Kevin? 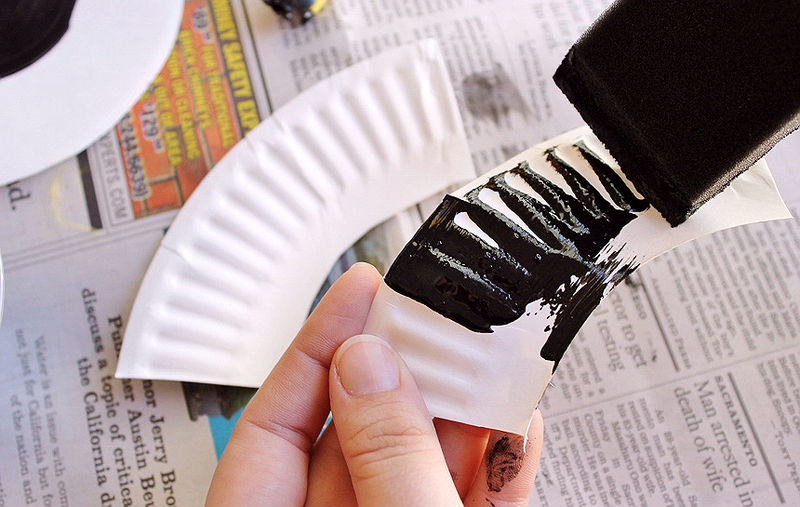 The possibilities are endless and the work is truly minimal; just my type of D.I.Y. craft. And you better believe the compliments from delivery workers, neighbors, and friends are plenty! Best of all, this is a fun wreath for the Halloween season that isn't spooky or scary at all! What type of seasonal decorations do you like to make? What Daughter Says: Fall leaves, ribbons, and acorns are nice, but this wreath truly makes me smile every time I come home! I cannot stand how cute that is. I absolutely LOVE it. I would never have thought to use the paper plate for the wreath. That is pure genius!! This is so creative! I would even hang this in my son's room after I was done using it as a home decoration. Who doesn't love the minions. This would be a great hit in so many households. It would be great to have a child help with this. Okay, I'm seriously impressed with how this turned out. 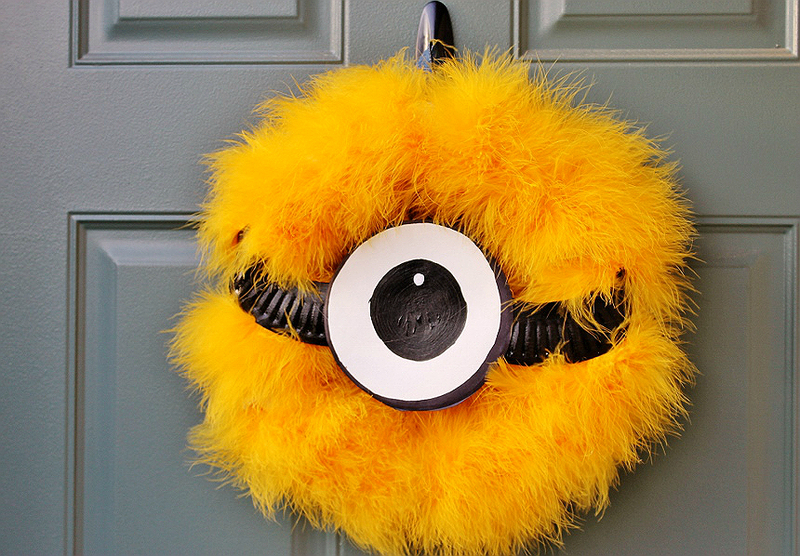 Pretty sure I need a Monster Minion Wreath in my life now that you mentioned it! Oh this is just the best! It looks so cute! I wouldn't want to take it down after Halloween. I love this wreath idea. I will have to get the supplies i need to make this. My kids are going to love it. My kids are going to love making this. It looks fantastic and easy to make. We are going to make it this weekend. What a cute idea this wreath is. My girls love the minions. They will love this wreath. 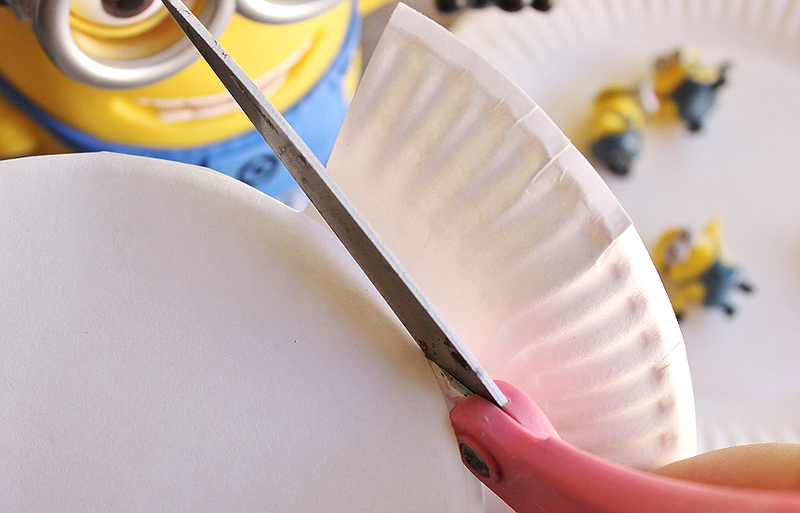 This is such a cute idea, my kids love minions so I know this would be a hit DIY idea for us to do together! This is honestly one of the CUTEST wreaths I've seen in a while!! Thank you so much for such a fuN DIY! This is so cute! My kids love minions! Adorable! I can't wait to make this with my kids! This is such a clever wreath idea that my kids would love! 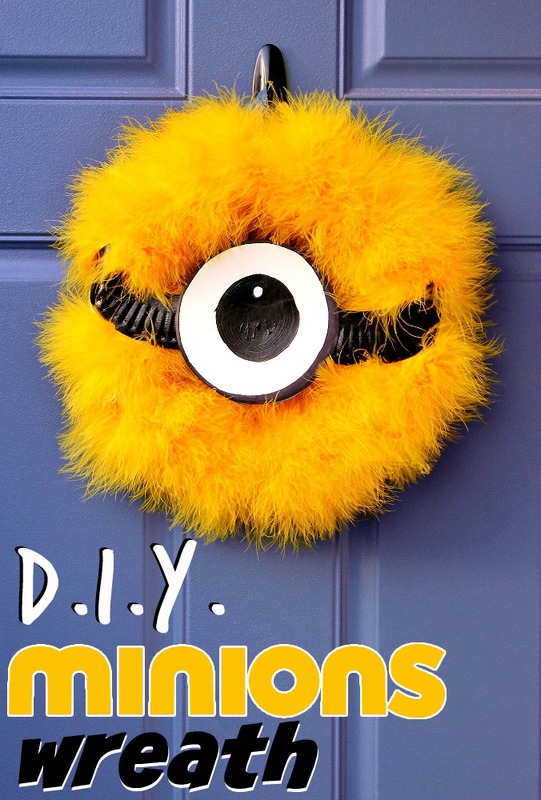 They are so into the Minions and would love to have this on their doors!